David Heldebrant (left) and Dongsheng Li received DOE Office of Science early career awards. Enlarge Image. 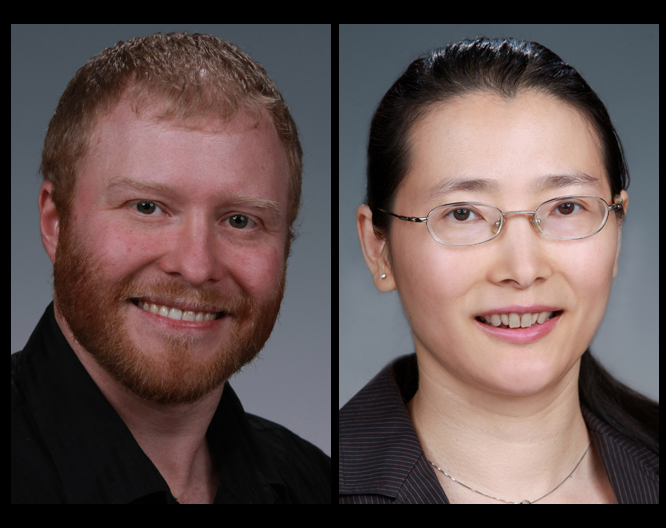 Two scientists from Pacific Northwest National Laboratory's Materials Synthesis and Simulation Across Scales Initiative were selected to receive 2015 Early Career Research Program research grants. They, along with PNNL's Brent VanDevender, were among just 44 recipients nationwide - including 17 at national laboratories - to receive the annual research awards, and were selected from more than 600 applications. Under the program, David Heldebrant and Dongsheng Li will each receive five-year research grants that fund work designed to reduce carbon emissions, create new materials for energy storage and measure the mass of some of the smallest components of the universe. "Supporting talented researchers in their early career years is one key to building and maintaining an effective scientific workforce for the nation," said Dr. Patricia M. Dehmer, acting director of DOE's Office of Science. "We congratulate the winners of this year's competition and look forward to following their achievements over the next five years." David Heldebrant. Coal-fired power plants are the nation's top source of carbon dioxide emissions - a leading culprit in climate change. For the past decade, governments and utilities have been looking at how carbon capture technologies might be deployed to reduce emission of greenhouse gas into the atmosphere, while enabling low-carbon electricity generation. Dongsheng Li. When tiny crystals known as nanoparticles assemble into complex, highly branched structures they gain unique properties that can be used to channel light, promote chemical reactions or store energy. Unfortunately, reliably making these structures is currently beyond the reach of materials scientists because there is little understanding of what controls the assembly of the particles. Determining how they attract and repel one another is the key to manipulating the formation of larger structures. But the systems are so complex, with a constant tumult of activity at the atomic scale, that most of the rules that govern these interactions aren't known. Discovery now is mainly through trial and error.